Most people who seek to improve their personal productivity are left with a bunch of anecdotes and tools. They fail to understand how to make it all work. What they don’t realize is they lack a system of improvement to make their process better. Now there is a new book that does just that. 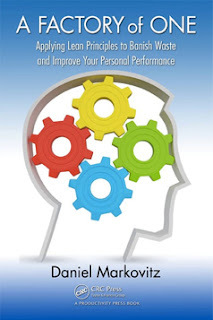 Daniel Markovitz authored A Factory of One: Applying Lean Principles to Banish Waste and Improve Your Personal Performance which describes how you can foster a new mindset and improve your performance by applying Lean methods to your work. Dan is the president of TimeBack Management, faculty member at the Lean Enterprise Institute, regularly teaches at the Stanford University Continuing Studies Program, and frequent blogger. This book explores in detail a theme that I’ve writing about in the past on this blog: how to apply lean concepts and tools to individual work in order to improve performance, reduce waste, and deliver more customer value. In my view, we too often focus on the entire value stream or a large process within that value stream, and ignore the way people work within that value stream. The same Lean principles that have improved efficiencies on the factory floor can be just as powerful—in fact, far more so—in helping individuals boost personal performance. Dan translates powerful Lean tools such as visual management, flow, pull, 5S, and kaizen to your daily work, revealing how they can help to improve efficiency, reduce waste, and link you ever more closely to customer value. This book not only provides the tools, but also teaches you how to find the root causes underlying your inefficiencies so you can eliminate them permanently. It will enable you to immediately improve personal productivity while developing the skills needed for continuous improvement. Dan challenges you to think more about your own process. He also includes real-world examples that illustrate how these principles have been successfully applied across a range of industries. Providing the perfect mix of what-to-do with why-to-do it, the text details a step-by-step approach to applying Lean principles to your work. Each chapter ends with simple action steps to get you implementing improvement immediately. This learning and doing will get your removing waste and improving the process by which your work is performed. This practice enables a foundation of excellence where you can imagine your workdays filled with value and progress. Dan writes this 145 page book with wit and passion which is so refreshing. If you want to be entertained and learn a few things about applying Lean thinking to your work then I highly recommend you read A Factory of One. Disclosure: Dan and I discussed several stories while he was writing this book, conversations I thoroughly enjoyed. He provided a copy of the book for my review. Thanks for the gracious review, Tim!